Because, Crikey, Australia Gets It First! 1 week before the US! We've got another ep coming slightly early! And it'll be a Rarity/Dash combo. What's going to happen with these two? Will RD be dressing in style? for people outside of Australia. when they can't find anything they both like to do together. Come visit us in our Allsparkle Discord Chat as the new episode airs in the US! ...I honestly don't know what to expect from this episode, though I fear it won't stick out either way. I'm interested enough because 'Trixie' but yeah, not expecting too much. Wait, my mind blanked. That's not this episode. Okay yeah I don't know what to think for this one. Honestly it just makes me wish the 'Let's Switch Bodies' fan animation happened in this. 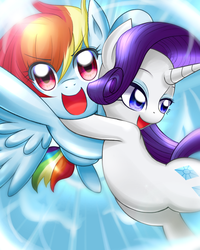 Seeing Rarity and Rainbow Dash swapped would be a lot of fun. Edited by videomaster21XX, 09 August 2018 - 01:09 PM. *gasp* Speak not it's name! Well, this one actually ended up being much more entertaining than I expected. Probably the best script G. M. Berrow's delivered for the show yet. It was okay. But honestly, sometimes it feels like when it comes to delivering the moral of the story, there were "Dear Princess Celestia" segments with more subtlety. Oh, it's a Berrow script. That explains a LOT. Erratically scheduled. Enunciation is importance. Is anyone watching it on TV or watching it commercial free? Just wanna know if we're synchronized. Today's episode: Twilight spends the day trolling Rarity and Dash. have they used "horse" before? Pretty fragile gems. They wouldn't last five seconds on Homeworld. Maybe they weren't ripe yet. Well, gems in this world always seemed to be kinda worthless. Rarity has the pronounciation of Caballeron right. Rose is just sitting there smiling to no one. Getting a pretty age-inappropriate ad for Suits here. I suspect all the students are involved in this, and the frog is Ocelus. "Let's toss all these super-dangerous magical items into a box together. Nothing bad could possibly happen." I guess nothing else to say. Fairly contrived episode. This is a season 1 episode trapped in a season 8 episode's body. G.M. Berrow isn't a terrible writer. She just arrived a few seasons too late, and her episodes are stuck in their own separate bubble. Her writing is skewed noticeably younger, and the rest of the show has grown up too much for her to hide it. This episode just does not belong in the same show as episodes like The Hearth's Warming Club. That said, this was decent by her standards, though I don't think her script had much to do with it. I think it's the storyboards that lifted this one. There's constantly stuff to look at here. RD's mannerisms are entertaining as ever. Berrow writes down to the audience...not in an obvious way, but in the sense that the plot twists are always very shallow and straightforward. For instance, note where I speculate that all the students are in on the fake theft. If I'd known this was a Berrow episode, I wouldn't have made that statement, because the most obvious and simple solution ("That's Spike's footprint, he's 100% behind leaving the trail for them to follow") would have clearly been the right one. A more complicated solution, such as the students working together to craft elements of the fake theft so that they could see things develop as they happened rather than just seeing the end product? Not in Berrow's wheelhouse. I'd rather have a 'Season 1' episode like this where its at least a bit fun then a 'Season 1' episode like 'Non-Compete Clause'. This one at least makes sense to me, a group of friends that always hang out, and eventually you realize you might only be hanging out with some of them because of the group. It still could have been handled better, but the concept works pretty easily and much better 'AJ and Dash are super competitive over something' a plot they've mostly gotten past long before the episode. I'd rather have a 'Season 1' episode like this where its at least a bit fun then a 'Season 1' episode like 'Non-Compete Clause'. That's fair. This one was more fun than that. I wasn't begging this one to end. Rarity and RD's interactions are inherently appealing, and the glitter was a surprise visual running gag. But, there was a weird immaturity to the characters here, and it's especially jarring with Rarity who's normally one of the more grown up characters. And you can't make an episode driven this much by Rainbow Dash not being able to stand Rarity's activities when you know and Rarity knows it's not true. Eh, not bad. The animations and expressions saved it, but otherwise pretty blah. I mean, they did touch on a rather large point for the group, but I don't think it was handled very well. Saw it. I was expecting to hate it cuz Dash but I enjoyed it a LOT. But when it came to the books part. I was AGHAST when Dash didn't read Shadow Spade. Then, ugh, Rarity didn't either! That part rang true. You beg other folks to read the stuff you're into and... sometimes they don't (jerks). Kidding. But still, that was great. When the theft happened, I didn't catch on that it was faked out because of the last episode with Flim and Flam and the missing book. I thought this was a continuation and this time, someone actually stole something important (so Amulet of Aurora because Aurora Borealis which controls the tides?). 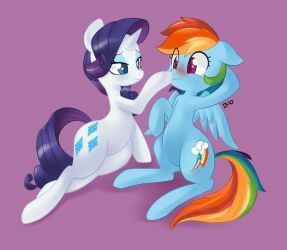 When Dash and Rarity started working together, I loved it. Even more still that it was Dash who appreciated Rarity first by calling the raft awesome. (though honestly, Rarity would have made a much more stylish boat, don't say she won't haha). They were doing great work, though I actually would have liked Dash to do more Daring Do stuff. Other than flying Rarity, it was Rarity who built everything. (though how in the world did Dash suddenly make a cute cloud like that? that was fun). I would have liked this tons better if the theft was real and it was a lead in to the arc mystery, if there is. But I surprisingly enjoyed the interaction. Did think it was good to do the pairings. I'm not going to go through each on but let's go for just Rarity. Rarity-Pinkie Pie... Where did that happen?!? I just recall "Rarity catch me!" and they ended up on the railroad going home taking a long time in the Applejack not-lies about not winning the rodeo thing episode. Rarity- Pinkie Pie was the episode where they had to find a gift for Maud in Manehatten. ... ok, I remember the gift for Maud... But... Wow, I don't remember their cutie map episode! Wasn't it, um, Rarity with Applejack when they helped pony's at the play in the park?